Since introduction in 2012, it is no surprise that Crusoe has become one of the miller’s first choice varieties. The variety has very good disease resistance, particularly to the key yield robbing diseases; Yellow Rust and Septoria tritici. Crusoe offers growers an excellent level of security, combining good agronomics with an inherently high protein content and good sprouting resistance; very desirable attributes for both grower and the milling industry. The variety also meets the specifications for the important export market, giving growers a choice of premium market opportunities, particularly for growers close to ports. 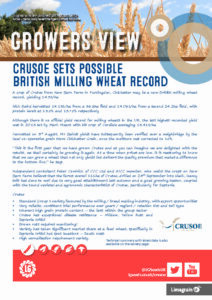 Crusoe has excellent grain characteristics – very similar to RGT Illustrious; a popular variety with growers and millers because of its agronomic and milling capabilities. The variety has a proven inherently high grain protein content; meeting the protein specification is vital to achieving the best milling premiums. Crusoe has excellent milling characteristics, producing high rates of flour extraction with an appealing white flour, married with good baking performance. Crusoe has produced high yields in the main bread-making regions of the UK. Crusoe has a very good resistance profile for all the major foliar diseases – mildew, yellow rust and Septoria tritici – making it an easy variety to manage. Growing crops should be monitored for brown rust levels and treated accordingly. Crusoe has short straw with good lodging resistance. It is slightly earlier than RGT Illustrious to ripen. All data is from the AHDB Recommended Lists 2019/20 database. See www.cereals.ahdb.org.uk for full dataset. On the 1-9 scales, high figures indicate that the variety shows the character to a high degree. All data is from the AHDB Recommended Lists 2019/20 database. See www.cereals.ahdb.org.uk for full dataset. On the 1-9 scales, high figures indicate that the variety shows the character to a high degree. @ = believed to carry the Pch1 Rendezvous resistance gene to eyespot but this has not been verified in Recommended List tests. Crusoe was added to the AHDB RL in 2012 and has shown consistency in yield performance in some very erratic weather conditions. The variety has a good agronomic profile with good disease resistance ratings, and an inherently higher grain protein content than its competitor lines in the group. Millers have seen increasing volumes of this variety through the plants and are happy with its results – giving good crumb structure and baking performance. Crusoe has shown good yield consistency over years, regions, rotational positions and soil type. Crusoe has good agronomic characters, combined with a very good disease resistance profile for the major foliar diseases – mildew, yellow rust & Septoria tritici – making it an easy variety to manage. Crusoe has a low level of resistance to brown rust; a consequence of possible race changes across Europe, but as long as the disease is monitored and applications of fungicide are made at the targeted growth stages, this should not be of serious concern. The Septoria tritici resistance of a variety should never be underestimated. This was highlighted in the 2014 season. Septoria resistance offers security of yield performance when erratic weather conditions prevail, restricting the application of fungicides at the key targeted growth stage timings. In many cases last season, when disease pressure was high and delayed fungicide strategies had to be implemented, Crusoe out-yielded many of the high yielding feed wheats. It has been very evident in the seed sales of Crusoe that the variety is being grown in associated regions, i.e. South West, as a feed wheat replacement, due to its robust performance in these high disease pressure regions.